The object of this series is to record, for the present and future generations, the story of the struggles and achievements of the eminent sons and daughters of India who have been mainly instrumental in our national renaissance and the attainment of Independence. Except in a few cases, such authoritative biographies have not been available. The biographies are planned as handy volumes written by knowledgeable people and giving a brief account, in simple words, of the life and activities of the eminent leaders and of their times. They are not intended either to be comprehensive studies or to replace the more elaborate biographies. The work of writing these lives has to be entrusted to different people. It has, therefore not been possible to publish the biographies in a. chronological order. It is hoped, however, that within a short period all eminent national personalities will figure in this series. THIS BOOK ON the life and work of Acharya Vinoba Bhave has been a quest for me, though I have been interested in his thought and activities for the last forty years. Still it cannot be claimed that the search is at all complete. Vinoba is too vast and too deep a subject for a complete search by a person like me whose efforts have only been directed towards understanding him intellectually. If I undertook to prepare this book, it was only because some persons who had been close to Vinoba had suggested my name to the late Dr R.R. Diwakar, the General Editon of this series, for writing this book, and wanted me to accept the offer and they were prepared to co-operate with me in this endeavour. In preparing this book, I have been greatly helped by several books, already available on Vinoba's life and work. My greatest debt, from this viewpoint, is to Kalindi's Ahimsa Ki Talash which gives Vinoba's autobiographical reminiscences in his own words, and then follow Baburao Joshi's Tapodhan Vinoba, Shriman Narayan's Vinoba: His Life and Work, Suresh Ram's Vinoba and His Mission, Vasant Nargolkar's The Creed of Saint. Vinoba and a few others, including Vinoba, Vyaktittva Aur Vichar, a publication of Sasta Sahitya Mandal, New Delhi. Except for Kalindi's work, none covers the period beyond the Bihar Storm Campaign for Gramdan (1965-1969) and that too has only been dealt .with by Shriman Narayan cursorily. Hence for. that campaign and the later period, I had mostly to rely on the various Sarvodaya periodicals in English and Hindi, especially the later, and on Maitri, a monthly published by the Brahma Vidya Mandir, Paunar, Wardha. A solitary book which proved of great help to me for the speeches of Vinoba during the Storm Campaign was Suresh Ram's Towards Total Revolution. There were several matters which required either clarification or more detailed information. In this I received full co-operation of Shri Shivaji Maharaj, the brother of Vinoba, Kalindi Bahan of the Brahma Vidya Mandir, Sarvashri Balbhai and Jayadevabhai who had worked as Vinoba's secretaries, Shri Ranjit Desai of Paramdham Prakashan, Paunar, Shri Narendra Dube, Secretary, Acharyakul and Khadi Mission, and of Shri Achyut Deshpande who has been quite close to Vinoba and was among those who had attended his famous talks on the Gita, delivered in Dhulia Jail in 1932. To all of them, I would like to express my deep sense of gratitude. Shri Achyut Deshpande has also been a source of constant encouragement to me throughout the preparation of the manuscript and my gratefulness to him is still greater. The late Dr.R.R. 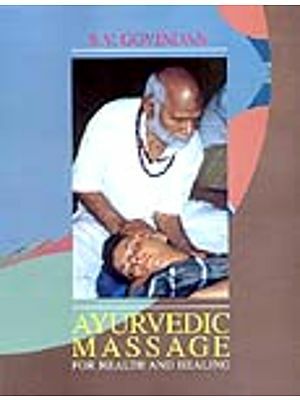 Diwakar had not only recommended my name to the Publications Division for writing this book, he also took interest in its preparation and his advice was always available to me whenever I sought it. Since he is now no more, my gratitude to him is all the more. I would also like to thank Dr Razi Ahmad, Director, National Gandhi Museum and Library, New Delhi, Shri H.S. Mathur, Librarian, and Shri M. Tiwari, Assistant Librarian, for their help in making books and periodicals readily available to me, to Shri N. Vasudevan, Director, Gandhi Book House, Rajghat, New Delhi, for his advice and help in the preparation of the manuscript, to Shri. CA. Menon Chairman, Delhi State Gandhi Smarak Nidhi, for his useful suggestions and for going through the typescript, to Shri Gautam Bajaj for his copyright photo of Vinoba and to Mrs. Praveen Kapur of the Gandhi Peace Foundation, New Delhi, for typing the manuscript. Lastly, my thanks are due to the Publications Division, Ministry of Information and Broadcasting, Government of India, for the confidence placed in me for preparing this manuscript. ACHARYA VINOBA BHAVE, generally called Vinobaji or Vinoba who succeeded Gandhi to the leadership of his constructive work movement, primarily aimed at building a new India of Gandhi's dream. He shot into fame as the father of the Bhoodan Movement and was also his spiritual heir. There is, however, no such declaration of Gandhi in its favour as it was in the case of Jawaharlal Nehru whom he named as his political heir. The reason is obvious. Gandhi wanted to leave no sect after him and hence the question of a declared spiritual heir did not arise at all. But there is enough indirect evidence in its support. Gandhi evaluated Vinoba's spiritual attainments very high, attached highest value to his views, and, according to Shriman Narayan, even looked upon him as his superior in certain aspects. That is why during his own life-time Vinoba was treated as such by those who were near to him and knew him. Gandhi's nomination of him as the first satyagrahi in the Individual Satyagraha of 1940 only set a seal on it. Kaka Kalelkar, who was ten years senior to Vinoba in age and knew him as a student, considered him 'senior-most' amongst the Gandhians, and K.G. Mashruwala who succeeded Gandhi as the editor of his Harijan Weeklies after his death and was a reputed interpreter of his thought, felt that Vinoba had understood Gandhi best. While nominating him as the first satyagrahi in 1940, Gandhi had to write a special article introducing him to the country. This was so because despite all his spiritual attainments and intensive constructive work at the grassroot level, Vinoba believed in reducing himself to zero. He says in his Abhang Vraten, "Vinya is a non-being like zero of Mathematics. The master or Guru is one and unique whose esteem grows by the addition of zeros." It were the force of circumstances, the compulsion of events, that made him leave his cell of Ward ha after the passing away of the Master and assume the leadership of the constructive workers, spread all over the country. He himself had once observed: "If Gandhiji were alive today, I would have never appeared before the public as I do today, but would have concentrated all my attention on village sanitation." To have a more concrete understanding of the greatness and importance of Vinoba, one may first know the opinion Gandhi held of him, even when he was in his early twenties. On Vinoba's joining his Ashram in 1916, Gandhi wrote to his father, "Your son Vinoba is with me. He has acquired at so tender an age such high spiritedness and asceticism as took me years of patient labour to do." And next year he told C.F. Andrews during his visit to Sabarmati: "He (Vinoba) is one of the few pearls in the Ashram. They do not come like others to be blessed by the Ashram, but to bless it, not to receive, but to give." And this impression of Gandhi only grew with years. 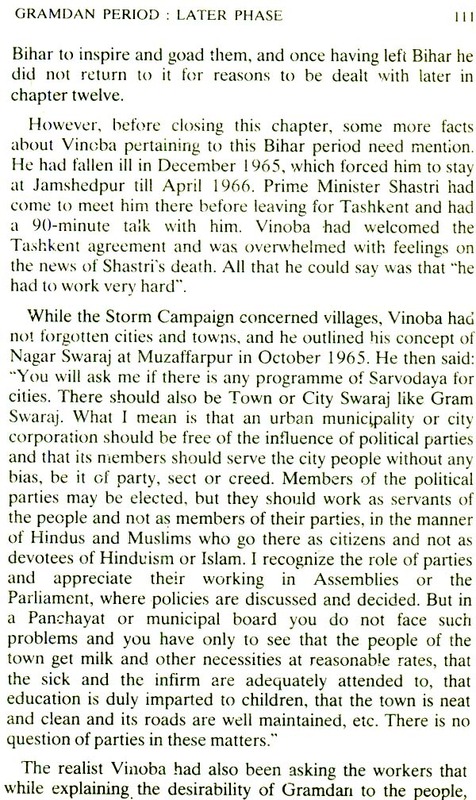 Jawaharlal Nehru, who met Vinoba for the first time at the Sevagram Constructive Workers Conference held after the death of Gandhi in March 1948, looked to him for guidance and confirmation of his viewpoints. He once said "Whenever I am in difficulty about a problem, I think of Gandhiji. But since Bapu is no more, my thoughts invariably turn to Vinobaji, whom I regard as the best interpreter of Gandhian thought and tradition." Jayaprakash Narayan's high opinion of Vinoba is testified by his remark: "Revolutionary and path-finding thinkers in history have usually been followed by mere interpreters, systematisers, analysts. There have been rare exceptions as Rosa Luxemburg and Lenin in the case of Marx. Vinoba is such an exception in the case of Gandhi." It is even reported that he always used to touch Vinoba's feet because of his highest respect for him. Vinoba, as indicated earlier, emerged on the Indian scene in 1940 and became a world figure with the birth of his unique Bhoodan Movement in the early fifties. His fame then travelled far and wide, bringing many foreigners to this country to have a close look at the man and his movement. Many articles appeared about him in well-known periodicals of the English-speaking world and also a few books, including one in French. He was admired for the originality of his ideas, for their clarity and for his knowledge of many languages. Hallam Tennyson, a great-grandson of the famous poet, rightly said of him: "Like a candle lit at a neighbouring flame, he now burns with a steady and separate light." And Donald Groom, a British Quaker knowing Vinoba' very well, wrote:"Vinoba sitting looks a picture of frailty. But speaking he becomes a picture of vitality, power, humour, goodwill. In that frail body is a vital spirit which moves him to creative action and gives him an inspiration which moves men." Arthur Koestler characterized the Bhoodan Movement "the greatest peace revolution since Gandhi", and Louis Fischer saw in it "the most creative thought coming out of the East".